One of the biggest barriers to teaching effectively is a chaotic classroom. Even if the entire class isn’t chaotic, one or two children who display undesirable behaviors frequently, can truly disrupt the classroom climate and instruction. I know a thing or two about this because each yearI had challenging students and still managed to be successful at achieving a positive class climate and culture. Many teachers in my building observed transformed behaviors and complete camaraderie within my class family and always asked what was my classroom management secret. They expected to hear some elaborate system or some magic formula when really it was quite simple. Did I use clips? Yes. Did I have whole class incentives? Yes. Were those the reasons for the decrease in negative behaviors and the cohesive class bond, that any outsider could feel? NO! We all know there are some children who could care less about a clip being moved, a card being changed or a few minutes off recess. Fortunately there is hope and there are things that will impact those children who display difficult behaviors to manage and its not the popular behavior/class management systems that you see in almost every classroom. There’s so much more to class management than any of the behavior management systems you find that involve a display or something tangible. I think I hear you asking….Well what’s the secret to success?! Wait for it…..
My classroom management system and secret was simply creating a strong positive class climate! Now I know what you are thinking. Shakara, “You don’t know the children I have and the types of things they do. I have children who are really out of control!” I do understand because I experienced that too. Each year I had at least two children with even extreme behaviors and other rowdy ones in the class as well. Every behavior you can think of, I’m certain I’ve dealt with, but I still found success with my system of building a warm culture and climate. I was intentional in my approach and my success was evident. Have you ever wondered why there can be a group of teachers have the same cute colorful behavior chart and have different results? Some may argue the behaviors may have been better in one class because of the different in children, but I have had students enter in my class from another class with the same stop light chart and incentives and have a completely different experience and greater level of success. The difference was me taking time to purposefully do things that would unlock the culture I needed to create, to have the smooth, dynamic year that every one of my student deserved. 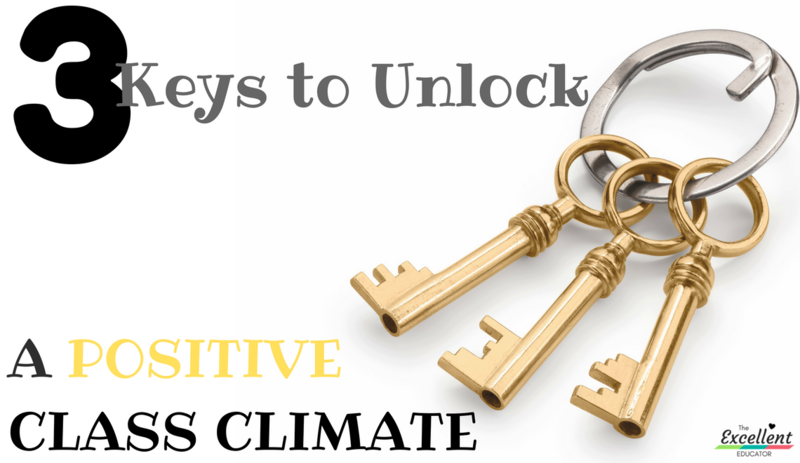 There are three keys that unlocked a positive class climate, decreased negative behaviors and led to the success and growth of all my students. Building a community of learners is the first key. It is also one of the first things that should happened before any instruction happens. It is true that children don’t care how much you know until they know how much you care so it’s our job to first show students that we care. It’s not enough for students to just know you care, you must create opportunities for students to grow to care about each other as well. Children and teachers who come from different backgrounds and experiences must learn how to function together and treat each other. This typically does not happen randomly, so teachers have to be intentional about building relationships in order to establish the necessary community that sets the stage for a positive climate. When you have positive relationships with people, you are less likely to want to hurt them and your interactions tend to be more positive and cohesive, whether it’s adults or little people. Once you have developed the community, teaching becomes less challenging because the negative behaviors will begin to decrease over time and a family feel with begin to emerge. Be sure to build student/student relationships, teacher/student relationships, teacher/teacher relationships (if you have co-teachers you work in your class) AND parent-teacher relationships. Morning meetings are a great way to build the relationships and establish community with students and teachers. It doesn’t have to be a long interaction that you probably don’t have time in your day to do. It can be 15 minutes and can easily include instructional components if you think your administrators will see it as “wasting time” 😏 . Morning meetings take place in a circle with the whole class, including the teacher. This is a daily meeting that students come to expect and even enjoy. It is a great way to do greetings, social and emotional activities, discuss upcoming topics, address issues, share and have fun together. Morning meetings were the core of my day but I also included other community building strategies throughout the day and throughout the entire year. Too many teachers view community building as a beginning of the year activity but that’s all wrong. Strong community building = strong relationship building and every strong relationship involves continuous upkeep. I will tell you that this is a process that takes time, so don’t expect it to happen overnight. The second key is establishing structure routines and procedures goes hand in hand with your community building. Some people disagree that structure is necessary with young children but without it – at least some aspects of it – the outcome will be chaos. Structure, routines and procedures are simply norms or an understood way of doing things. Just think about it. Every community and every place has norms to let you know what’s acceptable to do and not do. When you visit the grocery store there are norms, structure and procedures. At Starbucks there are structured norms. In church there are acceptable norms. At the bank and at the hospital there are norms. When we lack clear boundaries and expectations, we are not helping children to understand how to be successful and function in a way that is acceptable in the new climate they are in. Just as every household and every place has norms and a particular climate, so should each classroom. I know I’ve repeated this 20 times today and it’s only noon. I’m tired of saying the same thing over and over. They are going to think I am the worst teacher ever. Am I the worst teacher ever? How am I going to make it through the school year like this? This is my last year teaching. If you ever attend one of my trainings I am always honest with teachers and reveal that August-October were some of the most stressful times of the year. (To be frank, I thought I was going to lose it and I second guessed my decision to teach.) I would always convince myself that it didn’t take as long the previous year for my kids to get it and for things to finally gel. That wasn’t true at all. The end of the year is usually the lingering memory in your mind when children understand the norms and climate of the class because they’ve been immersed in it for 100+ days. Let me outline a few important structure tips to consider implementing. 1. Have a sign in of some sort along with your morning routine. 4. Create a system for transitions. Many children may already come to you knowing what these things are and if so, that’s fine. It is still important to talk about character in the context of a classroom and school community. If children come to you not knowing what these things are, then introducing character traits is that much more critical! The best way to introduce positive character traits is through literature and real life classroom situations. Talk about the importance of each trait and don’t forget to be transparent about how you have to exhibit these same traits as a teacher in your own life. (You know children are always interested in you being an actual person.) They have great book series for character development and you can also use popular books children love like Pete the Cat, to teach perseverance! When you take time to use these three keys, you will unlock a positive classroom climate that allows you to be the productive teacher you desire to be! I have found that neglecting to take the time on the front end will cost you double the time on the back end with the constant disruptions and daily behaviors that seem to feed off each other. These three keys will decrease behaviors and increase positive interactions, smooth days and increased learning opportunities. Doesn’t that sound like something you want?! You can do it. You’re equipped with the keys now! Do you have questions? Feel free to ask in the comment section below or send me an email.